Gloria telling Paul that she's going to testify and tell the police about the scare tactics. SHARON: I don't want to work with a bunch of *kids*! NICK: I'm going to get a *real* job. I'm not going back to school. NICK: Since I got my end-of-year results. You saw how I went. No use in *me* going into Year 12. SHARON: There is no time like right now, guys! Why are we sitting around talking when we should be out celebrating the end of school?! SHARON: Yeah, but we never do anything in the last week – and Bronny and I are going to Narrabri as soon as school's over, anyway. TODD: Yeah, and I'll probably be going to Adelaide to visit mum. MATT: Yep – and I'll be in Adelaide with the foster parents for Christmas, most probably. [To Lee] You don't mind, do you? LEE: No, of course not. SHARON: So you see: we won't all be together again until after the new year – so come on: let's party! Matt suggests a pool party at No. 30. Everyone rushes out to get their heatwave survival kit! HAROLD: Oh, you can't. You think it's perfectly all right just to show up here as if nothing has gone wrong? Well, I'm sorry, I'm not prepared to serve you. 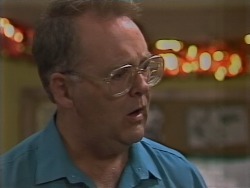 HILARY (looking astonished): Mr. Bishop, this is ridiculous – I haven't done anything wrong. HAROLD: Wrong, no... no, no, no I suppose you have a right to report me to the Health Department about the possum. HILARY (retorts): I did no such thing. KENNETH (looking sheepish): Miss. Robinson didn't report you to the Department of Health. *I* did. HILARY: Actually, Mr. Bishop, we've decided to eat *elsewhere* – *haven't* we, Kenneth. With that, Hilary and Kenneth Muir leave. Harold stands there looking flabbergasted. MADGE: Not that it's going to be a very *traditional* Christmas, anyway: Henry's in New Zealand... Scott and Charlene up in Brisbane... Kerry and Joe have gone away fruit picking... and Bronwyn's going to her father's place. Hardly seems like Christmas at *all*. Helen says she's worried that it's not going to be much of a Christmas in *their* house, either, and she explains about Rhys being sick and in hospital. Harold comes in at that moment and comments that it's a scorcher out there. Madge remarks that he's home early, and Harold explains that it was so quiet that he decided to close up; everyone has apparently decided to go to the beach. He heads over to the fridge and opens it. As he does so, a piece of paper falls off the door and he picks it up. He looks at it and Madge explains that it's her Lotto ticket: she missed the draw on telly and will have to check the numbers in the paper tomorrow. 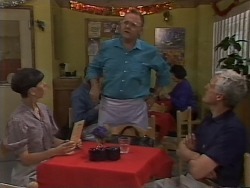 Harold offers Helen an ice-tea. She's miles away, though, and Madge tells Harold about little Rhys being very sick. Harold offers his sympathies. JIM: Hey... you don't have to put on your bedside manner with *me*. BEVERLY (murmurs): It's just that it makes me feel better when really all I want to do is fall apart. JIM: He's always seemed a feisty little fellow to *me*. He'll make it. JIM (sincerely): Yeah, I promise. HILARY: Kenneth! If you don't behave yourself, I won't allow you to be pool monitor anymore! Matt, Sharon and the others turn away in embarrassment! Beverly and Jim are sitting in the corridor, waiting nervously. A doctor comes along and tells them that Rhys seems to be responding to the drugs and is breathing without too much trouble; they should be able to take him home within about 48 hours. The doctor leaves them. Jim comments to a relieved-looking Beverly that maybe she can go home and get some sleep at last. Beverly, however, says she'd like to go and *sit* with Rhys for a while. Jim accepts this and tells her that he won't be long: he just wants to let Helen know. MADGE: Sounds as though you made quite an impression! HELEN: You needn't sound so surprised! MADGE: No, I think it's terrific! That plus the fact that you actually drove the car. Maybe now you'll stop all this nonsense about being ready for the scrapheap. HELEN: So it looks as if we'll be having a wonderful Christmas after all! HELEN (looking surprised): You too, Matt? 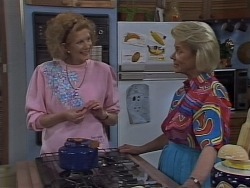 Madge suggests suddenly that they hold the pool party at her and Harold's place. 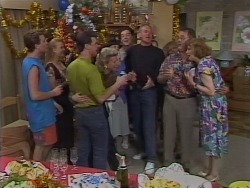 She adds that it would be nice if *all* of Ramsay Street got together for an early Christmas. Helen smiles that that's a wonderful idea! Madge remarks that if everyone's going next week, the party will have to be tomorrow! She adds that she'll leave Helen to notify everybody. Helen says she'll call Paul to tell him about Rhys, and she'll go and see Hilary *now*. HELEN: Well, I was just told that Matt was going to Adelaide when term ends – I assume to spend Christmas with his foster parents. HELEN: I'm sure that isn't true; perhaps I misunderstood? But if he *should* want to go, you won't take it too badly, will you? HILARY (looking downcast): This was to be our first Christmas together – just the two of us. I was looking forward to it a great deal. HELEN: Hilary, try and look on tomorrow's party as something special, hm? Make it a happy day. With that, Helen heads back to No. 26, leaving Hilary looking upset. 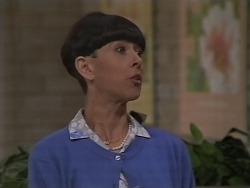 BRONWYN: ‘Mrs. Madge Bishop demonstrates her bouncing technique on reporter Stuart Burns'! HAROLD: Madge... look, look, look... the Lotto numbers. I'm *sure* some of those numbers are on your ticket. MADGE (sighs): Harold, I never get more than two or three numbers. HAROLD: Well, that doesn't mean you shouldn't check – not that I approve, of course! Madge asks him what he did with the ticket. Harold starts looking around, but can't find it. He asks what will happen if they've won and he can't find it. Madge just sighs at him to get out of her way: she's got a party to organise! HILARY: Then I hope you're giving *her* a better idea of your intentions than you're giving *me*. I mean, you just assume you can go skipping off to Adelaide without consulting me. Now, I may have made plans. For one thing, we haven't yet sorted out what's to become of these summer classes. MATT (coolly): There is nothing wrong with me wanting to go home for Christmas. Mum, they haven't seen me in ages, OK? Hilary asks about Lee: Matt twisted Hilary's arm for her to stay and then he's going off and leaving her. Lee insists that that's OK. Hilary adds angrily that she may have *organised* things. MATT (snaps): And never mind what *I* want, right? I've had *enough*. I'm going to go to Adelaide, if only because I need time to *think*. MATT: The way I feel right now, I'm not even that sure that I want to come *back*. With that, he storms out of the room. Lee watches him go, then looks at Hilary in concern. HELEN: Ha ha! I wish you'd think about going back to school. I mean, even if you just scrape through Year 12, you'll have a much better chance of landing a job than you have *now*. 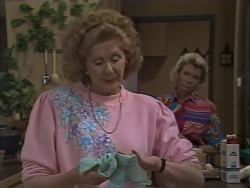 JIM: What's this: Erinsborough's answer to Emma Peel?! There are puzzled looks from the younger residents of the street! Madge demonstrates her self-defence techniques on Jim by bending his arm up behind his back! GUY: She's very worried about little Andrew – I mean Rhys. ADAM: That's not what *we* heard. A friend of Debra's is a nurse at the hospital. She said the kid was real sick, didn't she? ADAM (interrupting): Debra's very upset. She thinks maybe you're not taking proper care of him. BEVERLY (to Debra): You must have known I'd make sure he got the best care available? BEVERLY (frowns): What's *that* supposed to mean? ADAM: Well... maybe a Christmas present for Debra? Say... a thousand bucks? ADAM: There's no need to see it that way. It's just a way of showing how much the baby *means* to you. 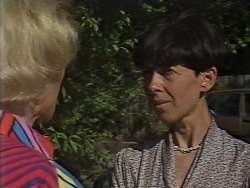 Beverly stares at Adam and then mutters that she'll write him a cheque. As she goes to the desk, Adam tells her to make it out to cash. He stands there looking pleased with himself. Debra looks worried. HILARY (curtly): Oh come on, Matthew, I'm no fool. You didn't seriously expect me to believe that you two were just good friends, did you? MATT (sighs): Mum, if you're going to start getting heavy about it, then...; what you going to do, anyway? Throw Lee out? HILARY: No, of course not. She can stay here while you're in Adelaide and then we'll decide what to do when you return. Matt and Lee, looking surprised and relieved, thank her. Madge walks over at that moment, saying they're a bit short of paper plates. As she bends to get them out of a cupboard, she finds her Lotto ticket. She gives the plates to Hilary and then picks up the newspaper to check her numbers. MATT: Hey, Jim, will that job still be available when I get back? JIM (smiles): It is yours on your return, my son! MADGE: Harold! We've won! We've won! MADGE: Second division! It's amazing! PAUL (exclaims): That's got to be worth *thousands*! BRONWYN (grins): I didn't think you *approved* of gambling, Harold! HAROLD (shrugs nonchalantly): Oh, Lotto's hardly gambling! [To Madge] How *many* thousands?! MADGE: I don't know – I have to divide up the prize pool – but it could change our lives! HELEN (beams): It's going to be a happy Christmas for *everyone*! JIM: I'll drink to that!